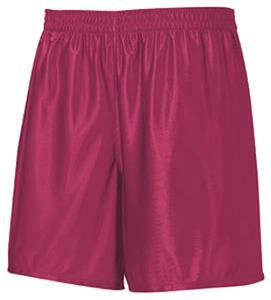 High Five Metro Soccer Shorts-Closeout are Soccer Shorts with 100% high-sheen "dazzle" tricot polyester which includes a Inside draw cord. Sizes: 20-22" 22-24" 24-26" 26-28" 30-32" 32-34" 36-38" 40-42" 44-46"
These shorts were exactly what we needed! The color is a deep, true purple. The sheen of the shorts is just right; not too bright, not too dull. They wash & wear well, high quality for a low price! Also, the shorts don't have pockets, precisely what we needed! My son wears these all the time! Great price!